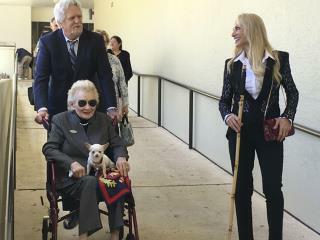 (Newser) – A 92-year-old Native Hawaiian princess has changed her trust to ensure her wife receives $40 million and all her personal property, including her Chihuahua "Girlie Girl," according to court records. Abigail Kawananakoa inherited her wealth as the great-granddaughter of James Campbell, an Irish businessman who made his fortune as a sugar plantation owner. Native Hawaiians, who consider her a princess because she's a descendant of the family that ruled the islands before the overthrow of the Hawaiian kingdom in 1893, have been closely watching the ongoing legal wrangling over her trust because they are concerned about the fate of the foundation she set up to benefit Hawaiian causes, the AP reports. Kawananakoa's lawyers have asked a judge to approve the changes. In September, a judge ruled Kawananakoa lacks the mental capacity to manage her $215 million trust, appointed First Hawaiian Bank to serve as trustee, and removed Jim Wright, her longtime attorney who stepped in as trustee after last year's stroke. After the stroke, Kawananakoa said she was fine, fired Wright, and then married Veronica Gail Worth, her girlfriend of 20 years. She attempted to amend her trust to remove Wright and replace him with three others, including Worth. She now wants to create a new foundation that will benefit Hawaiians and exclude board members appointed by Wright. The current foundation is asking a judge to appoint a guardian for Kawananakoa. It says it is concerned about artifacts—including a key to King Kalakaua's crypt—that the amended trust says will be given to Worth; the foundation says Kawananakoa had originally intended for them to end up in a museum. Could care less, could leave all her wealth to her cat if she has one. Before too long, the U.S. will have allowed the Criminals (Blue and White Collar), Latin countries, Pot heads and the Inclusive and Progressive crowd, to take over this whole world. Does everyone know what happen to Sodom and Gomorrah ? The End of this world, will be worse than that, so enjoy it now, because there will be no later. Only God’s Original Purpose for the Earth, will exist and the people that support his purpose . . . Only ! ! ! Lizzie poop got to her $goodies. She looks more white than Hawaii Five-O.